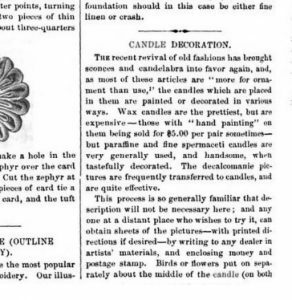 Candles served as the primary source of illumination during the 1860s. 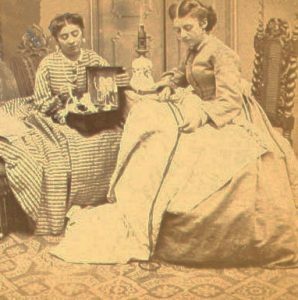 Conditioned to a lower level of lighting, Civil War women were well-adapted to sewing, reading and tending in subtle light. Safety, availability and expense made candles a more reasonable source of light than oil lamps, which were commonly fueled by whale oil, camphene, coal oil or kerosene. Gaslights were also becoming available during the period preceding electricity. Candles were also the favored lighting choice for travelers, which aided exposure of invention and technique throughout the North and South. A slower rate of burning and high-heat tolerance were key factors in the type of candle packed with supplies. Particular compositions were more well-suited to use in the home, and others were better performers in the camp and field. Candles were also used during ceremony and tradition, lighting celebrations, portraying symbolism and lighting the graveside. Mothers often kept a candle burning in a front window to guide soldier sons home from the war. Tallow, the fat of animals, is a low melting point material l used for candles as far back as ancient Egypt. Tallow candles were molded or dipped. 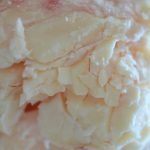 Beef or sheep tallow was most common. Ancient Egypt candles were prepared by soaking reeds in tallow. Romans were responsible for developing the wick-dipping method of candle making, which results in a sturdy, solid wax product. Tallow was easier to acquire than other options, but is not the most efficient choice for candle making. 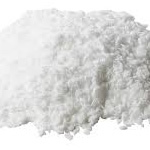 The low temperature melting point and oily composition of tallow emits a low light, requiring a thicker wick. The candles emitted a soot residue and an unpleasant odor after burning. Tallow candles require care during burn by snuffing the flame at intervals and clipping the wick between use. Beeswax was a more costly, but preferred, material for candle making during the Civil War. With a higher melting point, beeswax is clean-burning with a bright flame. Beeswax withstands higher temperatures and requires a smaller wick. In its natural state, beeswax is a yellow color, but was also bleached by sunlight to produce a creamy white color. Beeswax is the comb built by the bee colony to produce honey. Commercial agricultural processes were the mainstay of beeswax production, as most smaller farms were unable to support the number of bees to meet supply efficiently. As the wax is pliable during cooling, candles could be rolled by hand as well as poured or pulled through candle molds. A candle polishing cloth was used to smooth the exterior of the candles to a shine. Pure beeswax candles were the most costly, roughly twice the cost of tallow candles, but manufacturers lowered costs and increased profitability by adding fillers such as chalk, plaster, flour, resins or zinc oxide. These fillers lowered the quality of the candle but allowed producers to keep prices in line. The most sturdy Civil War candles were made from Adamantine (stearin,) which was created by chemical and chilling process that separated fat. Since chemical processes were required to product Adamantine, private households were unable to create the wax itself. The candles were about 1/2 the price of beeswax, burned longer and provided a bright, clear light. Proctor and Gamble’s Star Candle line was so widely marketed to both the public and military sectors and the name Star Candle” eventually became synonomous with admantine candles. 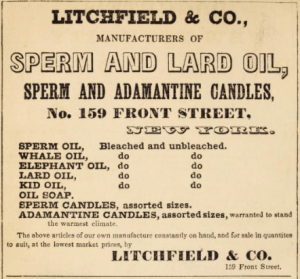 Spermaceti was a clean-burning commercially-produced candle wax made from oil from the head of the sperm whale. Spermaceti was also used as a hardner in cosmetics. Brightly burning and odor-free, spermaceti candles were preferred for elegant use. Ranging from white to yellow, this higher-end wax was also preferred as a non-staining option to tallow. Paraffin is a by-product of petroleum distillation. 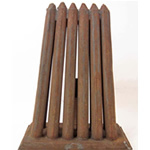 It was used for candle making and also for paraffin lamp fuel. 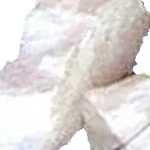 Paraffin is white, hard and slow burning. But, unfortunately, due to process and origination, it is also brittle and highly-odorous. During the production of paraffin the wax is plunged into a cold bath to stabilize.The process causes the wax to become brittle and difficult to work with. There were 614 candle makers across the North and South. These companies included Will & Baumer, Mack Miller, Muench Kruezer, Cathedral Candle Company. William Colgate, and Proctor and Gamble. Candle wax was either ledeled over wicks or poured into candle molds, then hand-rolled and polished to finishing. Dried wicks are looped over a bard and dipped in tallow; cooling between dipping. 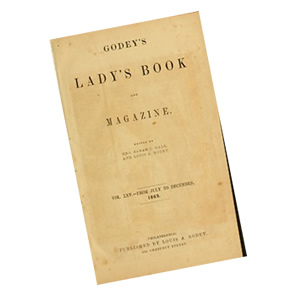 Scented candles were not commonly used in the home, but may have been used in the sickroom to alleviate unpleasant odors. To product scented candles, aromatic herbs were distilled and the scented water was combined with tallow and beaten. After forty-eight hours, the tallow had absorbed the scent and was separated from the water. Wax and alum were mixed with the tallow before molding and the wicks had been dipped in a combination of wax, spermaceti and gum Arabic. Finally, the candles were coated with glovers’ size, gum Arabic and alum, which eliminated a greasy exterior. Some scents used were lavender, thyme, rosemary, camphor, gum benzoin, and the perfumery staple Balsam of Peru.